I never ate vegetables growing up (unless you count corn as a vegetable, in which case, you should probably stop reading now). It wasn't until last year that I started experimenting with anything green and while I've learned to like a lot of stuff, there are many things I'm still not a huge fan of. Like Brussels sprouts. I've found and tried quite a few recipes for these mini cabbages, but not a one has caused me to fall head-over-heels with them. I was just about to write them off entirely (kinda like I did beets), until I saw this recipe on Orangette. Well, I'm in love and it may or may not be due to the 23452345 gallons of heavy cream this side dish calls for. Curious? Sure you are. First, round up all the stuff you need. 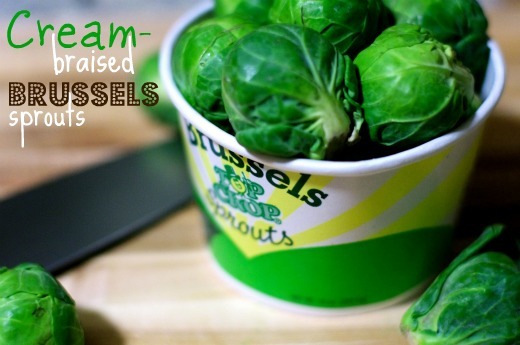 If you can get your hot little hands on some grass-fed heavy cream and butter and organic Brussels sprouts, do that. If not, you'll live. 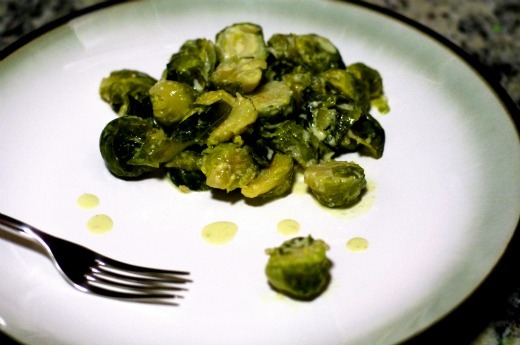 Next, wash off your Brussels sprouts, trim the little stems and chop 'em in half like so. Toss out any junky leaves that fall off. And they will fall off, trust me. 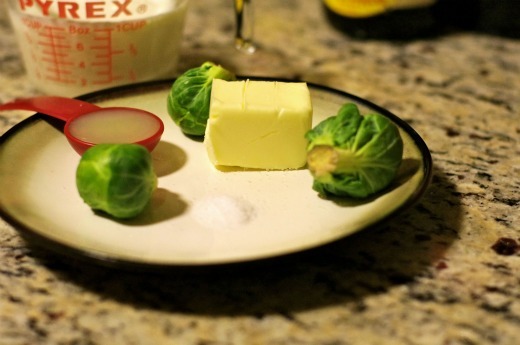 Melt your butter, then throw the sprouts in the skillet. Top 'em off with some salt. Then comes the cream...and then, the waiting. You should probably use this time to pour yourself a big glass of red wine and catch up on your favorite blogs. At the end of 30-35 minutes, your masterpiece should look something like this here picture. If it doesn't, five bucks says it's probably going to taste amazing anyway. 1. 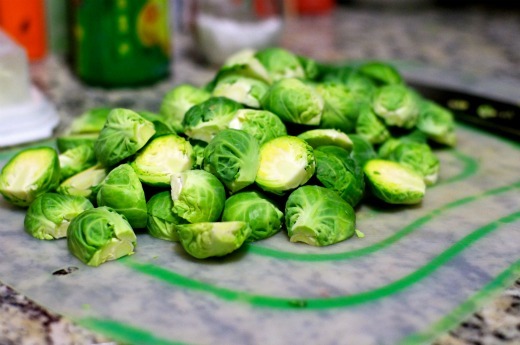 Prep the Brussels sprouts. Trim the stem end of each sprout and pull off any ragged or nasty outer leaves. Cut the sprouts in half from stem end to tip, and then cut each half in half again. Ultimately, you want little wedges. 2. In a large (12-inch) skillet, melt the butter over medium-high heat. Add the Brussels sprouts and salt. Cook, stirring occasionally, until the sprouts are nicely browned in spots, about 5 minutes or so. I like mine to get some good color here, so that they have a sweetly caramelized flavor. 3. Pour in the cream, stir to mix and then cover the pot. Reduce the heat to low or medium low: you want to keep the pan at a slow simmer. 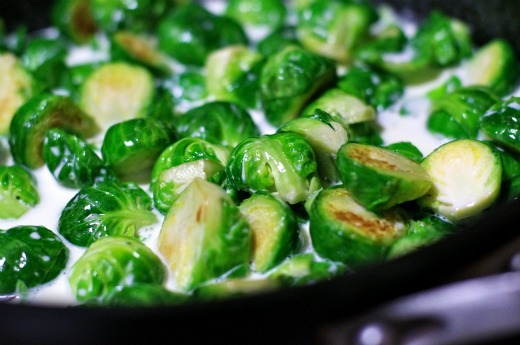 Braise until the sprouts are tender enough to be pierced easily with the tip of a paring knife, about 30-35 minutes. The cream will have reduced some and will have taken on a creamy tan color. 4. Remove the lid, and stir in the lemon juice. Taste for seasoning, and adjust as necessary. 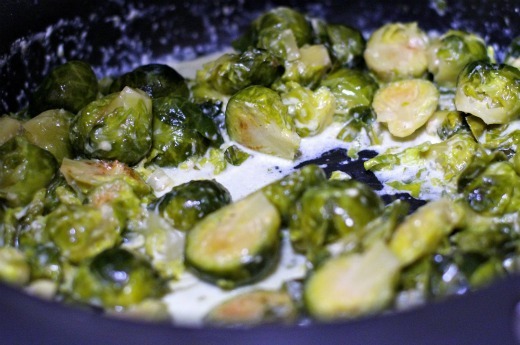 Let the pan simmer, uncovered, for a minute or two to thicken the cream to a glaze that loosely coats the sprouts. Serve immediately. Makes 4-6 servings. Oh wow. This looks amazing. I'll have to try this recipe during the holiday season. I'm excited for your recipes - I'm so bad at trying new things with veggies. Definitely making these! I am going to make this today. Did you have this as a side? and if so, with what?